The popular IndyCar driver, Sam Schmidt, was left a quadriplegic in a racing accident in 2000. In his desire to get be-hind a wheel, Sam Schmidt decided to collaborate with Arrow engineers to make his dream come true. The objective of the Semi-Autonomous Motorcar ‘’SAM’’ is to enable physically disabled drivers to experience driving again by leveraging the power of embedded technologies. 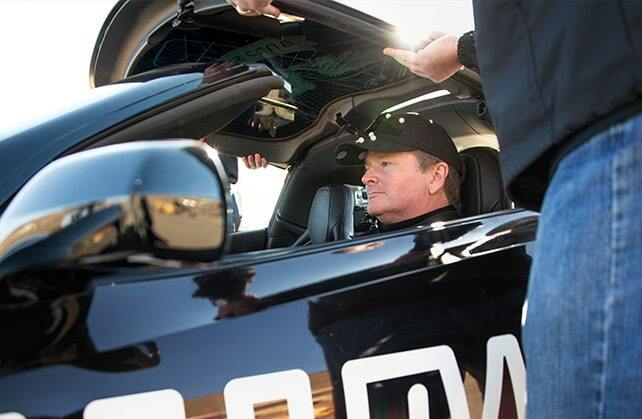 Based on a modified 2014 Corvette C7 Stingray bolstered by infrared cameras and sensors and cutting-edge technologies, Sam Schmidt is now able to steer, accelerate and brake by only using his head. The sensors and cameras have been calibrated to track Sam’s head movements, so that when he looks at a spot on the road, the cars automatically turns in that direction. In regard to speed, the car accelerates when Sam blows into a specialized straw and slows down when he inhales. On April 2015, Sam drove a 1.9-mile road course at the Long Beach Grand Prix. The Arrow Sam Car is a constantly evolving project, combining the software and hardware expertise of different companies such as Arrow, NXP Semiconductors, Ball Aerospace and Witekio. In the first version of the Sam Car project, (V1.0) Witekio developed all the intelligence for the car, including the software architecture and communication between all the components of the car. The developments were deployed on an x86 platform running QNX as operating system. Arrow’s idea was to use and connect together ready to use products. In Sam Car V2.0, Arrow’s wish was to reduce the number of components in the car, while upgrading the infrared cameras and sensors to respond to the minutest movements of the driver’s head. Witekio seamlessly migrated all the Sam Car V1.0 previous developments on a new NXP processor based platform. The project is now working on Boundary Devices Nitrogen6X Single Board Computer, still running QNX. This part of the project highlights our software system integration services coupled with our in-depth proficiency of NXP processors offering. In regard to low level expertise, we developed a communication hub that will gather and interpret the data coming from the braking, steering and angle sensors. As soon as the data are interpreted, they become operable information and are sent to the i.MX 6Quad processor via CAN bus. These developments totally changed the way how the wheel is controlled. For instance, in Sam Car V1.0, the car was controlled with head inclination, now in Sam Car V2.0 the car is working when the driver’s head turns to right or left. What could be more gratifying than helping someone to make his dreams come true? The Arrow SAM Car project was a technical challenge, in which we worked in close collaboration with Arrow Electronics, NXP Semiconductors and Schmidt Peterson Motorsports, to define, develop and implement a powerful reliable system that will allow a former Indy Racing League driver, now a quadriplegic, to drive again.